Attention: Do you want to quickly and easily increase your social network traffic? "Now, With Just A Few Clicks Of Your Mouse You Can Add Effective Social Widgets To Your Wordpress Blogs And Tap Into MORE Social Traffic!" Whether you’re a blog owner, Internet Marketer or selling products and services online, this is the definitive tool that will allow you to finally get more eyeballs onto your social pages! Subject:How to increase your social network traffic. If you’re an inernet marketer like me then you are constanly looking for ways to get more social traffic, right? But as you may already know, it’s tricky sometimes. At one point or another, it’s something we all experience and although it’s not a nice feeling, there’s a practical solution that solves this common problem. Look,I have very good news for you. Simple. I have right here the perfect solution to increase your social traffic literally overnight…and I know, that’s a pretty bold statement. But as you keep reading you will discover that I’m saying that for a reason – a reason SO powerful that it will help you transform everything. I’m not here to play games with you. Nor am I trying to sell you a poorly written e-book or a magical, miraculous “push-button software” that will send you a tidal wave of traffic just by clicking the right button of your mouse. Those things are for other people who are really desperate and believe anything. You’re different. So before continuing and revealing to you what it’s all about, I’d like to make sure you’re qualified. Want technology that will make your life easier. Want to increase your social traffic in a way you never imagined. It’s Time To Finally Get More Attention And Get NOTICED – Click The Link Below And You Will Get Immediate Access To WP Social Widget® V2! Option A is to keep struggling to get social traffic and be frustrated all the time because you simply aren’t getting many eyeballs into your social pages. Option B, the most recommendable to you, is to secure a copy of WP Social Widget®v2 and never look back. I’m sure that you’re going to make the correct and wisest choice. 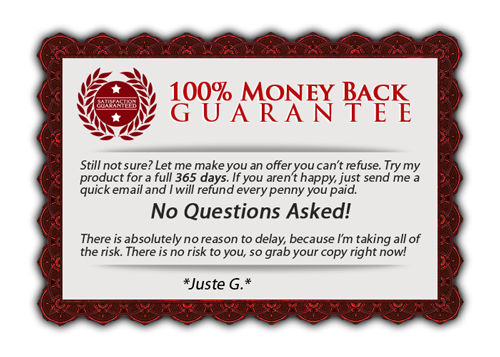 You’re fully protected by a solid, ironclad 30-day money-back guarantee. This means that if you’re not fully satisfied with WP Social Widget® v2, all you have to do is let me know, and I’ll promptly and courteously refund your money. 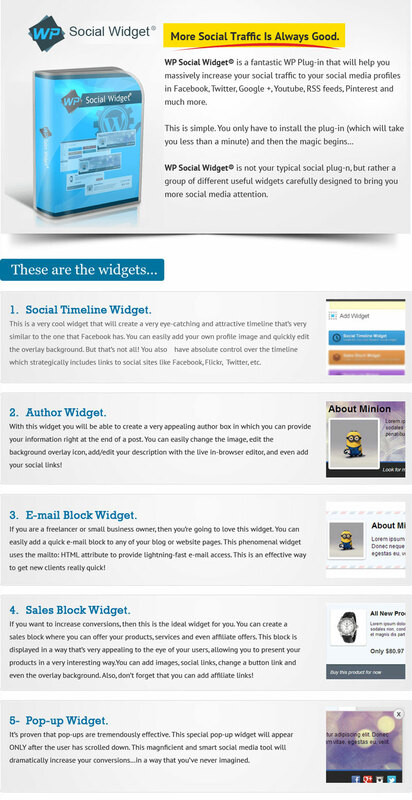 CLICK HERE and download WP Social Widget® v2 NOW! [YES] - You can not sell Resale Rights, Master Resell Rights or Private Label Rights To The Package - only personal rights. No limitations - Use this on as many of your blogs you want! (unlimited site license). STOP wasting time with bad social tools - and use professional widget now! There are so many reasons for you to download your copy of the WP Social Widget v2 right now, but first you should know the extremely low price that is available now won't be there for very long! Make sure to grab you copy right now before the price increases! For a limited time you can download your copy for an extremely low price! Take action - Get Yours NOW! PS. Remember, there are no risks whatsoever here. Just download WP Social Widget®V2 and if you’re not happy for any reason, don’t worry, just send me an e-mail. You will get your money back in almost no time! Disclaimer: ClickBank is the retailer of this product. CLICKBANK® is a registered trademark of Click Sales, Inc., a Delaware corporation located at 917 S. Lusk Street, Suite 200, Boise Idaho, 83706, USA and used by permission. ClickBank’s role as retailer does not constitute an endorsement, approval or review of this product or any claim, statement or opinion used in promotion of this product.